After a tumultuous off season, it may just be a relief to get back to just playing some games. 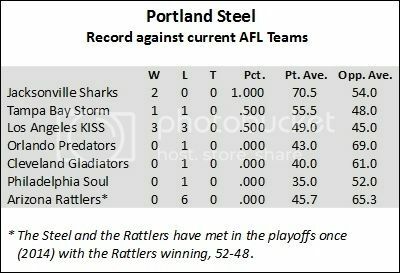 The newly branded Portland Steel embark on their third season on April 1 with a home match up against the Arizona Rattlers. Kickoff is set for 7 p.m. at Moda Center at the Rose Quarter. It is the third time in as many seasons that the team will open the campaign at home. Portland has undergone a plethora of changes over the past six months since they last took the field. There is new ownership (so to speak), a new look and a new coach. On January 6, the Arena Football League announced that it had taken over operations of the team from owner Terry Emmert. The Clackamas businessman, who formed the team in the fall of 2013, had not signed his Commitment to 2016, citing concerns about the league's insurance policies on its players and difficulties attracting inventors. The AFL operates on a single-entity system where all monies put into the league are pooled among the teams. In this case, with the league owning the Steel, the AFL's other seven owners are essentially paying the team's bills. This is the arrangement for the team until a new owner is found or until the league folds the team. Since Emmert owns the trademark to the Thunder and its logo, the AFL decided to re-brand the team. Welcome to the Portland Steel. AFL commissioner Scott C. Butera announced that the name Steel was chosen, at least in part, because of steel used in Portland's 12 bridges, as well as iron being discovered in the Portland suburb of Lake Oswego in 1840. With the new name comes a new logo, colors and uniforms. Emmert had hired Chehalis, Washington native and former Spokane Shock head coach Andy Olson to be the team's third head coach in three seasons. However, after the league takeover, the AFL opted to fire Olson (and line coach Clay Harrell). The same day, the league announced they had hired coaching veteran Ron James to take over as both head coach and general manager. James has held head coaching duties with the Las Vegas Gladiators, Utah Blaze and Pittsburgh Power, as well as several assistant coaching positions. He has a 57-52 regular season record and 1-2 record in the playoffs. "I'm looking forward to being in Portland," James told me on twitter earlier this month. "(I'm) in Portland and getting ready for training camp to open." The most exciting off-season acquisition was the signing of former Cleveland Gladiators quarterback Shane Austin. However, on March 28 he was put on "Other League Exempt," which is an AFL term which typically indicates that he has signed or is working out with a team in the National Football League or the Canadian Football League. In this case, Austin is working out with the Saskatchewan Roughriders of the CFL. Austin's AFL rights for the time being will remain with the Steel. That puts the offense in the hands of journeyman Danny Southwick, whom Portland fans should remember from his eight appearances for the Thunder in their inaugural season in 2014. He completed 165 of 263 passes (62.7 percent) for 2,040 yards, 38 touchdowns and 17 interceptions. Southwick split time last season between the Spokane Shock and Los Angeles KISS. Second-year man Kasey Peters will serve as the backup. Harvard alum John Collins returns to the team at center for a third season (though he is considered in his second; AFL rules state that a player who appears in less than four games as a rookie is still a rookie until he completes his following season). Collins was named to the All-Arena Second Team last season. Five-year veteran Mark Jackson, Jarien Moreland and rookie Rico Forbes out of Washington St. will also comprise the wall of protection for Steel signal callers. In all, the four linemen average nearly 6'5" and 315 pounds. The receiving corps could be a surprise for the Steel. Nick Truesdell at 6'7" is a red zone threat, while the team acquired former Oregon Duck tight end Colt Lylerla, who is a big target anywhere on the field. Jared Perry is the lone returning receiver and could see some time returning kicks. Like Truesdell, Jabin Sambrano and Rashaad Carter came over from the Shock during the off season. At 6'3" and 335 pounds, Deveric Gallington is the team's fullback. Just two players return from last year's defense. Bryce Peila, in his third season out of Western Oregon, is the team's elder statesman. The former All-Arena linebacker/defensive back has recorded 123.5 tackles, 11 interceptions, 5 fumble recoveries and 7 defensive touchdowns in his two seasons with the team. Mac linebacker Robert Hayes is the other returnee, having appeared in 11 games for Portland last season. After struggling in the kicking game during their first two seasons, the team may have just found their kicker in Ernesto Lacayo. Last season with the Las Vegas Outlaws he made 54 of 59 extra point attempts and was 2-4 on field goals. Portland's schedule is a mirror of sorts, The first half of the season is road heavy with two of the first eight games on the road, including a pair of three-game road trips in April and May respectively. The April trip features cross-country games against the Orlando Predators and Philadelphia Soul. After a bye week, they travel to Phoenix to face the Rattlers. 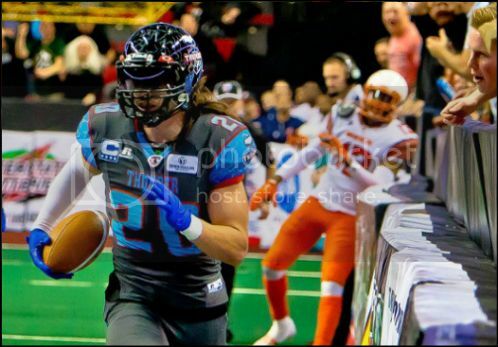 Following a home date against Portland's fellow 2014 expansion team, the KISS, the Steel find themselves back in the eastern time zone to face the Cleveland Gladiators and Jacksonville Sharks. They then face the KISS in the last game of May. 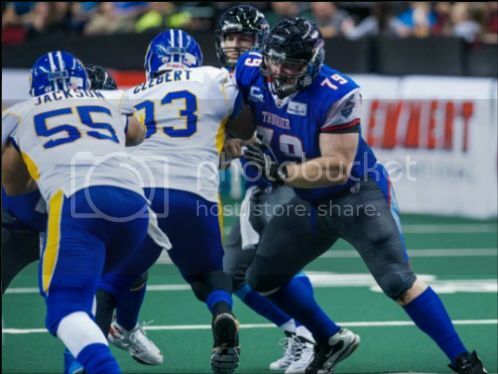 The progress and success of the team could be difficult to gauge at that point in the season given the heavy road and travel schedule, and the fact they twice play the Rattlers, who many consider the favorite to win ArenaBowl XXIX. That should give the team a chance to come on in the second half of the season, which features six of eight at home. The Steel's only road games are against the Rattlers on June 11 and against the Storm on July 23. In the middle of that is a four-game home stand against the Gladiators, Soul, Predators and Sharks (there is a by week between the second and third games). Finally, the Steel close the season at home against the KISS on August 1. With the AFL down to eight teams this season, there are a trio of interesting dynamics. The first is the realignment of the league with the Steel, Rattlers, KISS and Gladiators comprising the National Conference. This moves the Gladiators over from the American Conference. The Soul, Sharks, Storm and Predators make up the American Conference. The league has, at least in the short term, eliminated divisions from its standings. The second is the frequency by which teams play one another. Each team plays two of its conference opponents three times, sans the Gladiators who play a more geographically friendly schedule. Each team plays the other teams twice; once at home and once on the road. With the schedule being reduced from 18 games to 16, this essentially works. The third dynamic is that given the level of teams and the breakdown of conferences, each team will earn a spot in the post-season tournament leading up to ArenaBowl XXIX. Seedings will be based on overall AFL standings rather than broken down into individual conferences. The four top seeds would be given home-field advantage. This would tend to take advantage of the schedules and the fact each team plays each other team at least twice. Some have criticized this, calling it a 16-game pre-season. What it, in fact, does, is level the playing field, giving lower seeded teams an opportunity for a playoff upset. Others call this a move toward some parity. Ultimately, the AFL is keeping its playoff format and likely satisfying CBS Sports Network and ESPN2's opportunity to broadcast a maximum amount of playoff games as possible. Portland will be featured on national television five times over the course of the regular season; four on CBSSN and one on ESPN2. All games not on CBSSN also will be able to be streamed live on ESPN3/WatchESPN. 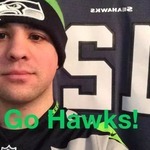 Non-nationally televised home games have been broadcast in the Portland area on Comcast Sportsnet Northwest. No announcement has been made by CSNNW as to whether it will televise the six home games not scheduled to be broadcast nationally. Neither has an announcement been made as to a radio partner for Steel games. Those games were broadcast on 750 the Game during the 2014 and 2015 seasons. Should any local television and/or radio agreements be made, that information will be available on the game threads here at SCtoC. The stage is set for the third season of the Portland's AFL team. There could be some learning curves during the first half of the season, but should they come out light on the injury front and find some consistency on both sides of the ball, there should be some cause for optimism. With an experienced coaching staff in place and a familiar quarterback under center, this could be an interesting season. For the Steel, fans will just hope it is not the last. Thanks to a trusty detective at ArenaFan, Shane Austin's fate has been revealed. He's in mini-camp with the Saskatchewan Roughriders of the CFL. That information, which apparently none of the Portland area news sites picked up on, was buried in a March 22nd article in the Portland Tribune. that's a huge hit for the Steel. Austin was supposed to be our leader. signing him was one of the few highlights over the off-season. Angi, you've done it again. great work at being so thorough and getting everyone prepped for the season. i'm glad Collins and Peila are back, but we lost so many guys, like Varmah Sonie and John Martinez. this kind of feels like an expansion season. 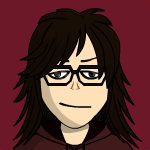 btw, i'm going to edit the thread with the Shane Austin information. Maybe the fact we know Southwick is the starter going into the season will make a difference for us. It seems like he has always joined a team after the season stared. I thought no we have really good receivers and I love watching Peila play. hopefully that's the case with Southwick. he's kind of been thrown into the fire over the past couple of years at least. maybe the extra time getting used to his receivers will pay off. It sure sounds like we have a young team. It is kind of like the Blazers. Maybe we can surprise some people by playing hard and having some good chemistry.